What is an Energy Star rating? And how does it relate in terms of energy efficiency to the appliances that have this logo and compared to other models? ENERGY STAR is a U.S. Environmental Protection Agency voluntary program that helps businesses and individuals save money and protect our climate, through superior energy efficiency. The Energy Star program was first developed in 1992 by the US Environmental Protection Agency (EPA) as a method to identify and promote products that are the most energy efficient. Since its initial onset, the government has partnered with other industry members, to promote and expand the scope of this project to include, not only major appliances but also new homes and buildings. So the Energy Star rating program encompasses a wide variety of products. There have also been many major advances in technologies, leading to such energy savers as LCD lighting and 'stand-by' product features. Research and development are still on-going, as manufacturers strive to deliver low-cost energy products. 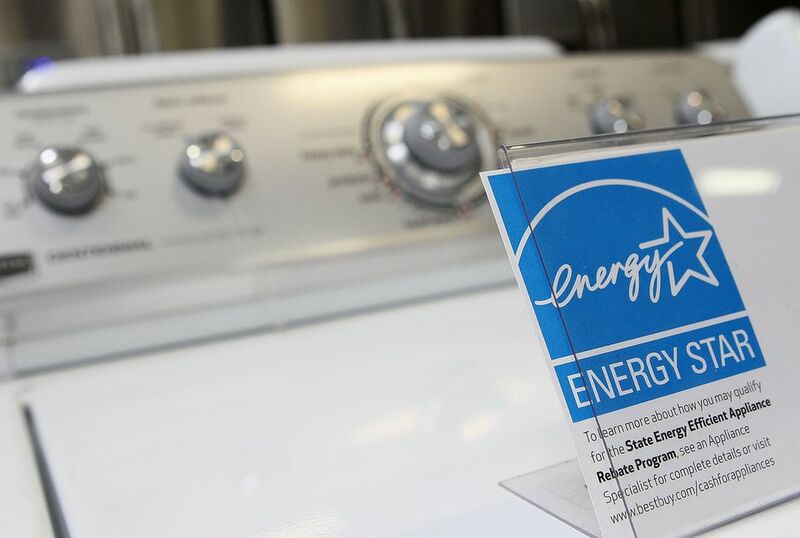 An appliance which sports the Energy Star label is not necessarily a better product than a comparable model, but in order to be Energy Star qualified, it must meet strict energy efficiency guidelines, as set out by that program. Look for this label when shopping for an appliance if you want to reduce your energy costs. When purchasing appliances, watch for the Energy Star rating and other energy efficiency information. Note that an appliance labeled 'energy efficient' may use less energy than others in its class, but may not meet the strict standards to be an Energy Star product. So the term is rather vague and can often be misleading. Appliances carrying the Energy Star rating typically are 10 percent to 20 percent more energy efficient than non-rated models. This means, you'll not only save money by purchasing an appliance with the lowest Energy Guide rating, but you'll also reap additional energy savings if that appliance is also Energy Star qualified. This is a great way to increase your energy savings, plus also help your environment as well. While you'll find the Energy Star logo only on qualifying energy-efficient products, there is another program that is designed to help you further understand energy costs and which can serve as a useful comparison tool, when shopping for an appliance. The Energy Guidelabel comes with new large appliances and offers consumers insight on that particular model's estimated annual energy use under average conditions. While the actual energy consumption of any appliance will vary per household, the Energy Guide does provide a way to compare usage estimates, before buying a certain model. The label will show typical usage under average conditions, in kilowatt-hours (kWhs) per year. As a consumer, you can compare the energy labels of the appliances on your short list, when trying to decide which one to purchase. The lower the energy number, the more cost-efficient it is to operate. That translates into reduced energy bills at month end. There is another rating that consumers should pay attention to, especially if your local utility supports purchases of efficient appliances. The CEE tier shown on new washers, dishwashers, refrigerators or air conditioners, means that the appliance is likely more efficient. Check the specification or visit your local utility website for up to date information, since these tiers and the measurements used are always a step ahead of the technology. While the CEE rating does not replace an Energy Star rating, it complements it.